Today during the WWDC keynote at the Moscone Center in San Francisco, Apple spent a good 40 minutes walking through the latest features of OS X, the powerful operating system that runs on its laptop and desktop machines. 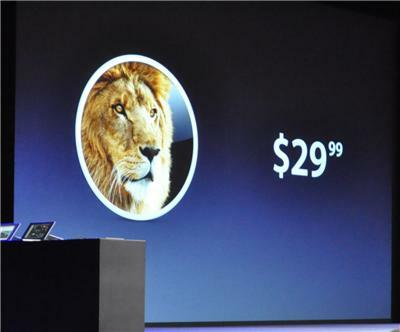 The latest version of OS X, called Lion, has been in testing with developers for months now, and now we have a better idea of when customers will be able to get their hands on it: it’s coming in July, and it’s going to be a mere $29. And there’s another significant piece of news: you won’t be able to purchase Lion in retail stores on a physical optical disc, as it will only be available as a download via the Mac App Store. The download will weigh in at around 4 gigabytes, or around the size of a movie. The developer preview will be available today. This isn’t actually the first time Apple has offered an OS upgrade at a steep discount compared to its Windows rival (which typically runs over $100) — Snow Leopard made its debut at $29. But that was considered more of a stability and performance upgrade as it didn’t have many new features; Lion is packed with additions.